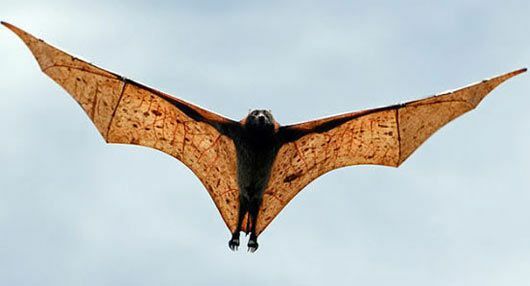 The Giant Golden-Crowned Flying Fox, also known as the ‘Golden-capped Fruit Bat’, is one of the largest species of bats in the world that are found only in the Philippines. With their huge, tall size, they fall under the group ‘megabat’ and are one of the rarest bats in the world. They are facing a severe threat of extinction, and in need of immediate and proper conservation. Other than poaching, habitat-loss is also one of the major factors for their present-day population crisis. 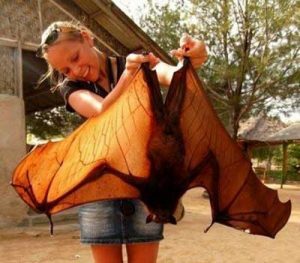 Size: The wingspan length of these bats can be anything between 1.5 – 1.7 metres. Their head and body height varies between 178 and 290 mm. Weight: Not much heavy in proportion to their size weighing only between 0.7 and 1.2 kg. Body Color: The golden cap, along with an orangish-yellow part at the back of their neck, contrast with the brownish-black fur on the rest of the head and the reddish-brown fur on the back. Wings: Wings are exceptionally large and holds the forearms that vary between 125 and 203 mm. Eyes: Eyes are specifically large, very much like that of a dog or a fox with a face of its size. Tail: No tail like all other species of fruit bats. Due to lack of study, not much data is available about the longevity of these bats. 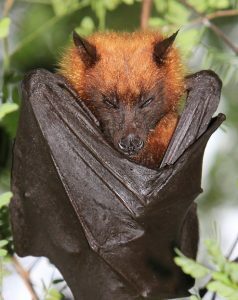 The Giant Golden-Crowned Flying-Fox is found only in the Philippines, though not spread all across the country. Their location is limited to a few islands namely, Luzon, Polillo, Mindanao, Mindoro, Negros, Bohol, Boracay, Cebu, and Leyte. These mammals typically follow the river routes, making researchers believe that, this is because of the possibility of abundant foods along the areas. 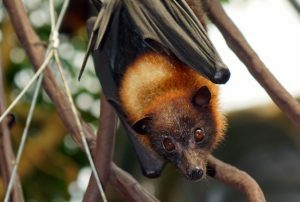 These mammals hang upside down from the trees of the rainforest, as well as in the deep caves. These mammoth bats are primarily nocturnal with the ability to travel more than 40 km in one night searching for foraging. They consume different kinds of food and then disperse the seeds through their feces, helping many fruit trees in the Philippines grow. Thus, they act as natural pollinators, and play an important role in the ecosystem. 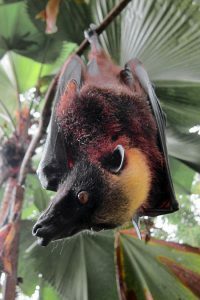 During the abundance of fruits, or in areas where fruit is ample, these bats would form their own colonies which can, reportedly, be as many as 150,000 individuals. This is also one of the primary behavioral characteristics that helps them stay warm and avoid predators. However, it is also this very behavior of roosting that makes it easy to hunt down these creatures. 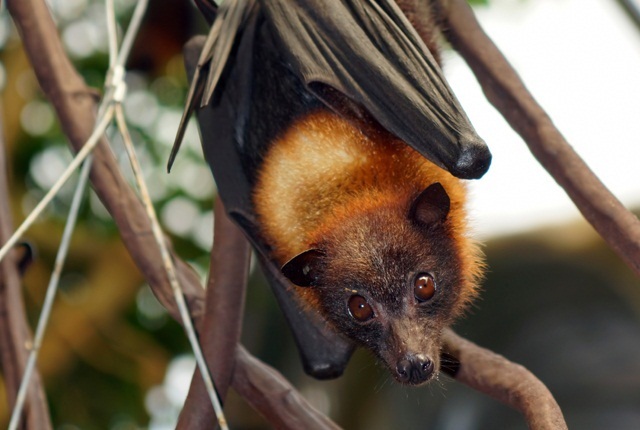 They are also known to colonize with another species of bats, the Malayan Flying Foxes. Like other bats, they hang upside down while resting. These mammals spend quite a good amount of time regularly for personal care and grooming. They use water to groom themselves, and while doing so, they display a very interesting behavior. They use their large wings to scoop water from ponds or nearby water bodies and spread the water all over themselves. These bats are frugivorous, that is, they mainly live upon fruits. It includes all kinds natural or cultivated fruits available locally including papaya, lamio, etc., but figs are their most favorite. There is not much information about the reproductive behavior or mating rituals of these bats. This is mainly because of the isolated locations where these giant bats live. Though, some research has shown that there are chances that they have two mating seasons annually. However, the female of this species become pregnant in any one of the two. The female bats attain the age of sexual maturity at two years of age. Typically, this bat gives birth to one baby at a time. The baby bats would cling to the fur of their mothers using the claws. The female use one of its wings to fan the juvenile for keeping it cool. The female bats spend a lot of their lifetime upon their young ones through gestation and lactation. The contrasts in colors orangish yellow, brown-black etc. help them mingle with the environment and camouflage themselves with the branches, twigs and dry leaves. They have big, large claws that are strong enough to hold their large body hanging downwards. These bats have large eyes which are thought to be used as visual cues during communication as well as to assist more light to enter through their cornea. These bats have no known predators posing threat to their existence in their region except for human predation. They are caught in large numbers by poachers in many locations mainly for their meat and pelts. 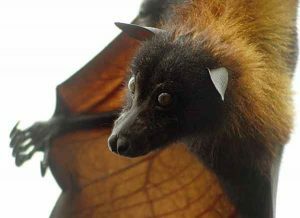 The Giant Golden-Crowned Flying-Fox is a threatened species with a diminishing population, and is almost on the verge of extinction. The IUCN 3.1 has categorized it under the ‘EN’ (‘Endangered’) species list. It gets the name ‘golden-crowned flying fox’ from the golden brown fur it has on its head, and its strange resemblance to the foxes. These bats have a distinctive odor on their body. This suggests a possibility of some olfactory communication, however, no scent glands in these creatures have been identified. DNA profiling has concluded that, these bats are not genetically related to the fox. 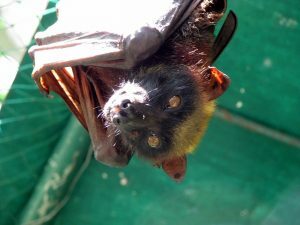 Serological tests that were conducted on these bats showed that, they might be the carriers of the deadly ebola virus infection. Though, further tests on viruses-infested bats are still ongoing. 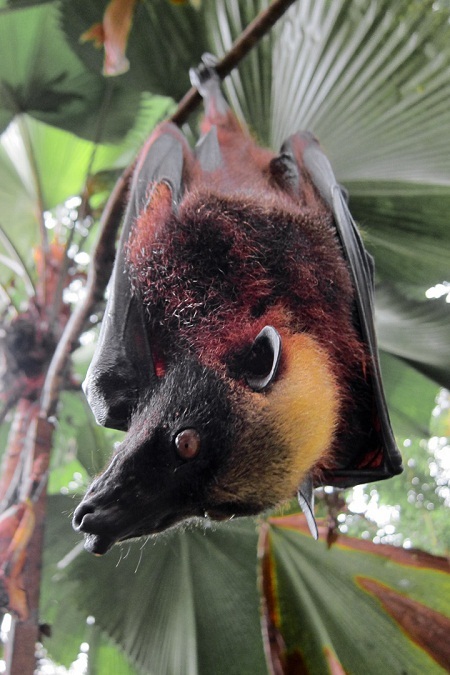 The Golden-Crowned bats are in tough competition with humans for fruits. When fruits are taken from the habitats these bats live, they have no other option to feed themselves. 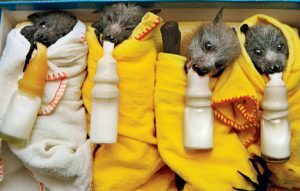 Though they are not dangerous to humans, vaccination and proper training is required before handling these bats, since they might be the carriers of certain fatal diseases. This is also the reason why they are not recommended to be kept as pets. The wings of these bats are so large that they are sometime seen using them to wrap their bodies like a cloak.